This is a very nice dinnerware set. It is well made and the design and finish are very good. I expect it will last a long time. Would recommend. Make any meal a party with this decadent and durable dinnerware. The stoneware construction adds a high-quality look and feel, and the pieces are dishwasher-safe for convenient cleanup. From Gourmet Basics by Mikasa Collection. Crafted of Stoneware, featuring a reactive glaze. Due to the nature and hand-crafted qualities of reactive glaze, no two pieces are exactly alike and will exhibit unique variations in color and pattern. Product may slightly differ from image shown. A round platter is especially versatile. Beautiful, quality stoneware. Order came quickly and in pristine condition. Love the pattern on these plates, bowls and mugs. Would highly recommend this product. We really love this set. Much prettier in person than online. Subtle blues, grey and cream, with a dark brown base, varying patterns on each piece. Nice heavy stoneware. We did have one box arrived with broken pieces, but customer service quickly replaced it and the next box was perfect. Highly recommend this set. Since these arrived, they have replaced our "old stand-bys" for everyday use, as they are very attractive, perfectly sized/weighted (our other stoneware is very heavy), and have been holding up well to washing in our dishwasher. Unlike other stoneware we have, which started to chip after a few uses, these seem much sturdier. Nice neutral tones make them versatile, and the subtle pattern adds interest and charm. Beautiful and well crafted stoneware. I love the color and texture of this stoneware. My Step mother bought me a set and she loved it so much, she had to buy herself a set too. I recently expanded my set with this additional 16 piece set because one of my plates chipped on the granite counter :(. Beautiful dishes! Would definitely recommend to a friend. Great color and quality. Wish there were matching pieces. I like this Multicolor Stoneware and the set is very durable. I would recommend this product. I really like the earth tone colors. 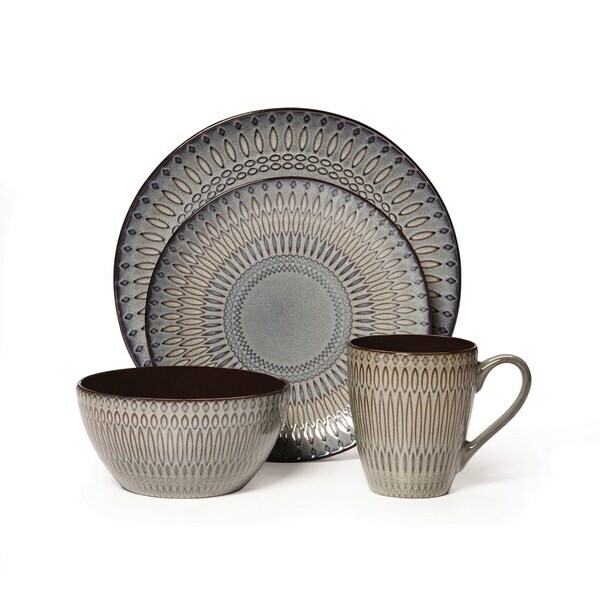 I am not a big fan of stoneware, but this dinnerware set is really nice. Good quality and not too heavy. I bought it for the outdoor dining and love how it worked out with the furniture I already have. 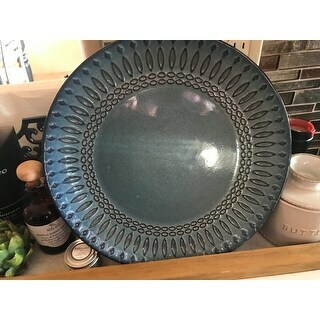 Great looking plates and bowls lots of compliments works in microwave and also dishwasher safe I would definitely buy again!! Love the dish set! The colors look great with the placemats I already bought. Was also thankful they came in good packaging and nothing was broken. Will buy another set once my new porch furniture comes! Vey pretty. Each box came well-packed with all the pieces intact. Happy to be replacing my old set with this one as soon as the new kitchen is installed. 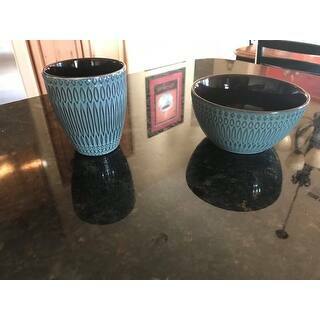 The photo on the Overstock.com website displays these as as a brownish tint ceramic with a bit of blue undertones, when in fact they are the complete opposite. Mostly blue with very Little browns. Wonder if they sent me rejects...…. I love this set of dishes. It matches the colors in my kitchen and home perfectly. So far they seem sturdy and no chips from shipping. I love them! Love the color of these dishes. They are very sturdy and have held up well in the dishwasher. Great price. I would definitely purchase again. "Is this product lead free?"